Caption slip reads: "Photographer: Emery. Date: 1959-04-05. Reporter: Emery to RW. Assignment: Wisteria Festival. 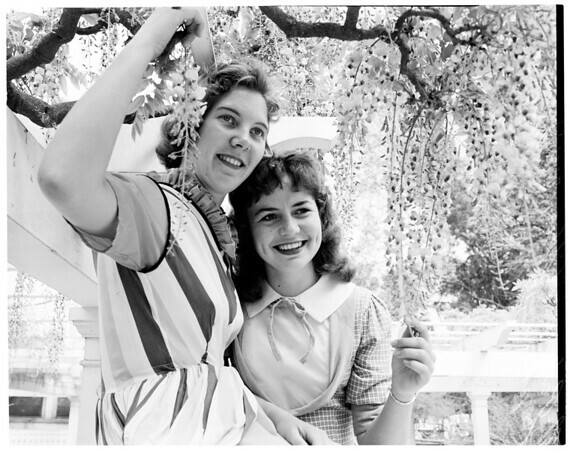 L. to r., 30/31: At Banning Park, Wilmington, Patricia Hiller, 18, Long Beach State College student and friend Jan Hopkins, 17, Banning High School (Wilm) student, smile through blooms of wisteria vine. This at 9th annual Wisteria Festival".